Our quest for knowledge about the natural world is an intrinsic part of our humanity. From the first cave-paintings to the most advanced computer illustrations of today, art has served to clarify and codify our scientific knowledge. 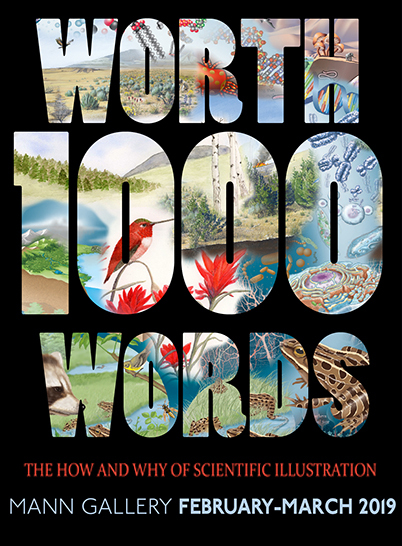 Scientific illustrators translate complex facts into pictures, creating images that aid in the understanding of science and nature. With this new winter exhibit at Mann Library, we invite you to come inside from the cold to enjoy the world of science and art, featuring pieces by the Guild of Natural Science Illustrators - Finger Lakes Chapter. Worth a Thousand Words will be on display in the Mann Library Gallery February 1 through March 2019. The installation of this exhibit in the Mann Gallery is supported by the Elizabeth Betty (E.) Rowley Fund For Mann Library. For questions or further information, please visit mannlib.cornell.edu, call (607) 255-5406, or email: mann-public-ed-prog@cornell.edu.